This is a BIG book. A heavy book. And it's full of memorable and sometimes thought-provoking portrait pictures. 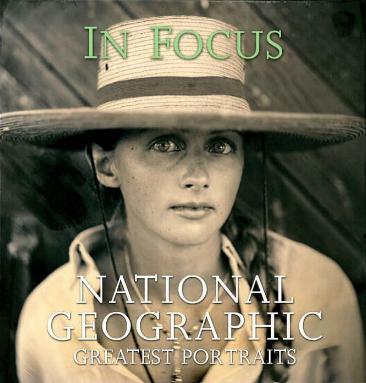 The book is divided into these categories: National Geographic Portraits Before 1930 - The Strange and the Exotic; 1930s-1940s - Away from Depression and War; 1950s-1960s - Cheerful Kodachrome Days; 1970s-1980s - Back to Realism, and 1990s - Present - Photography and Ambiguity. As Chris Johns (Associate Editor National Geographic magazine) says of these pages, "...they are graced with uncommon photographs of common people." Personally, I love looking at photographs and looking into them, beyond the obvious. Very often there is something else going on in the picture. If not, then I enjoy imagining the lives of the subjects. The beauty is that there are portraits from all over the world - a fantastic insight into other cultures and our differences. National Geographic goes where the average person never hopes to go, seemingly squeezing into unheard of places on the globe so that we can marvel over their work, learn, and expand our own minds and horizons. Some of my favorite pictures are on pages 55, 174, 234, and 398. Conclusion - A fantastic book for anyone's collection.